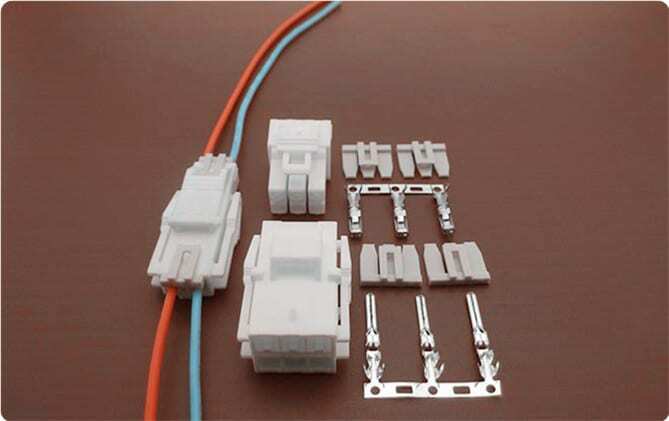 SCT4501 Series are compatible with JST-YL 4.5mm series wire to wire connectors. Scondar offers SCT4501 Series as replacement and cheaper alternative of JST YL 4.5mm pitch wire-to-wire connector in a complete package including the male housing, female/receptacle housing, female terminal and male terminal, all manufactured with precision-fitting and durability ensuring accurate mating. JST YL supports up to a maximum 10A of current per circuit and up to 8 positions, so your product can reliably deliver power even when space is limited. A special feature of the JST YL series, as compared with the JST EL is that it has secondary retainers that aids in correcting partial insertion or accidental release of contact. The secondary retainers enhance safety when the contact is partially inserted or when accidental release of the contact happens. It also retains proper positioning of the contacts and securely locks it in place. However, when a 3-row connector or AWG #16 is used, it may not perform this specific function as well as it performs with 2-row connectors. The JST YL 4.5mm pitch series can also be easily mounted on panels of various thickness without using tools and fasteners. In addition, the simple push-in feature and anti-rattle panel gasket of this wire-to-wire connector enables easy and convenient panel mounting. The contacts of each connector has a pair of locking lances that are installed so that the contacts can be symmetrically locked in the housing. A retraction mechanism is installed providing security of holding the contacts inside the housing. Also, the lances have enough space to allow the contacts to be easily inserted into the housing. To facilitate a secure connection without dropouts, a positive locking mechanism feature greatly enhances wire-to-wire mating connections. This also prevent stress concentration during connection, thus allowing the components to survive repeated matings. Two different kinds of crimp contacts are available for convenient branching or internal jumpering. You can expect that your wire-to-wire connector package is undisturbed during the trip and has maintained its vitality even during your production stages, which is why a lot of our customers has raved about our product for both cheaply-priced and, at the same time, resembles the JST YL 4.5mm pitch wire-to-wire product in performance and quality.